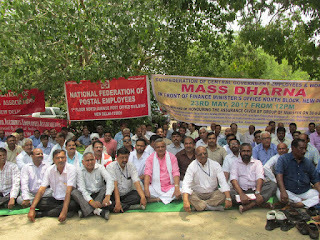 The mass dharna organized in front of Union Finance Minister’s office at North Block, New Delhi was a thundering success. Inspite of repeated intervention of the police authorities and also denial of police permission in the last minute, employees and pensioners poured in thousands from all parts of the country and defeated the attempt of the authorities to prevent the Confederation from conducting the dharna at the declared venue, North Block, the centre of governance of Govt. of India. About 3000 employees and pensioners participated. As South Block and North Block are highly protected security zone in Delhi, during the last more than 15 years, no agitational programme could be organized near South/North Block. The dharna participants included employees from various affiliates of Confederation, Central Government Pensioners Associations, Autonomous body employees and pensioners. 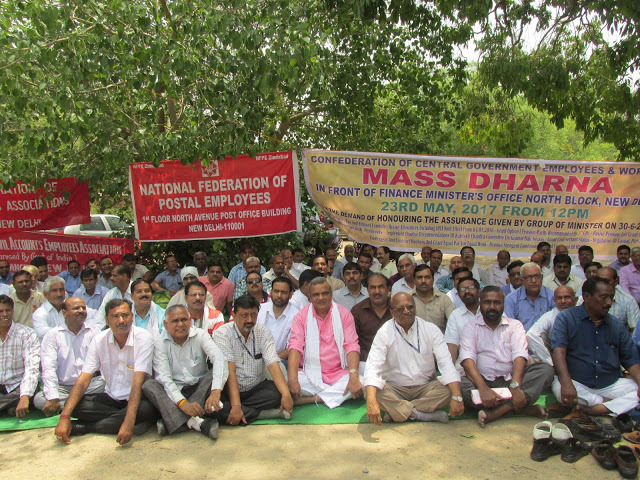 As a mark of solidarity and support of Central Secretariat employees, the leaders of Central Secretaries Employees Associations also participated in the mass dharna. The demands raised in the 21 point charter of demands of Confederation submitted to Government during the 16th May 2017 strike was highlighted. The demands included honour assurance given by the Group of Minister’s on 30.06.2016 to NJCA leaders, Increase minimum wage and fitment formula, grant revised allowances including HRA and Transport Allowance from 01.01.2016, Implement option-I parity recommended by 7th Pay Commission for pre-2016 pensioners, Implement positive recommendations of Kamalesh Chandra Committee Report on GDS and grant Civil Servant Status to Gramin Dak Sevaks, Regularise casual, Part-time, contingent, daily-rated and contract workers and grant equal pay for equal work, withdraw stringent conditions imposed on MACP promotions, Scrap PFRDA Act and withdraw NPS, stop outsourcing, Fill up all vacant posts, remove 5% condition on compassionate appointments, upgradation of pay scale of LDC/UDC, parity in pay to stenographers, Assistants, Ministerial staff in subordinate offices and in all organized accounts cadres with that of Central Secretariat staff etc. The mass dharna organized in front of Union Finance Minister’s office at North Block, New Delhi was a thundering success. Next programme i.e; HUMAN CHAIN of Central Government Employees and Pensioners in all major cities in front of all important offices on 22nd June 2017.